Florida residents will have quick and easy air access as well as other travelers connecting through the Fort Lauderdale/Hollywood, West Palm Beach and Miami International Airports with Silver Airways. Silver Airways offers two daily flights out of Fort Lauderdale/Hollywood and scheduled flights out of Miami on Mondays, Thursdays, Fridays and Sundays. West Palm Beach schedules coming soon as service begins April 20, 2017. If Silver Airways doesn’t fit into your travel plans from South Florida, Tropic Ocean Airways also offers scheduled flights from Fort Lauderdale. Private charter service is also available through Island Air Charters and Tropic Ocean Airways and should be considered when traveling with 4 or more people and those that wish to fly on your schedule, and offer the convenience of small airport security, parking and gate free hassles. Coming from central Florida makes the list of easy places to get to Bimini from. Beginning on April 27, Elite Airways will operate two flights per day on Thursdays and Sundays between Orlando Melbourne International Airport (MLB) and South Bimini Airport (BIM). The new route offers east-central Florida residents with a convenient alternative to driving or flying to south Florida or the gulf coast to catch a flight to Bimini. Getting from South Bimini – Bimini International Airport on South Bimini is a small airport. Upon arrival, you’ll clear Bahamas Immigration, pick up your luggage and clear Customs, As you exit the terminal, several taxi vans will be waiting – they are pretty much time their schedules based on scheduled arrivals and communication with the airport as to inbound charters. Please take one of these vans to the ferry dock, and transfer by water taxi to Bimini Big Game Club Resort & Marina. The water taxi will dock near Reception at the resort. The entire transfer from airport to resort takes approximately 10 minutes. The charge for the combined van and water taxi is $7.00 payable in cash only. If it’s the clear blue sea that catches your travel style, there’s the FRS Ferry Service out of Miami. It’s about a 2 hour trip and you can enjoy the bar service, duty-free shopping and more flexible cargo options if you travel heavy or transporting gear. 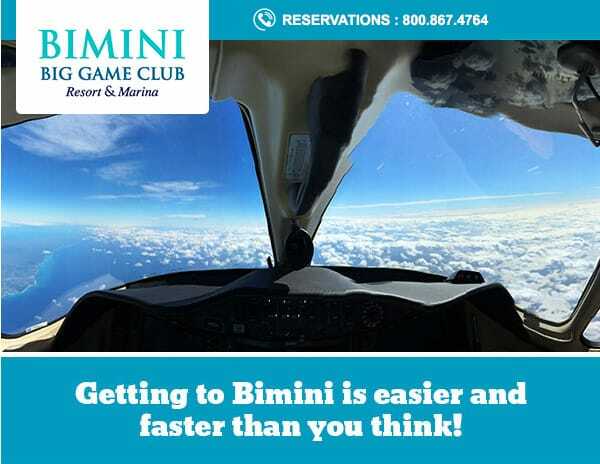 Whichever way you choose to travel, Bimini is just a short hop away. Contact our US Travel Office at 1-800-867-4764 for assistance and information in booking your next stay and travel.